Growth in the use of cell culture for biological research, vaccine production, the production of therapeutic proteins, and emerging regenerative medicine applications are driving the global cell culture market. As second-generation biologics such as monoclonal antibodies replace first-generation therapeutic proteins, there is also an increased demand for more advanced in vitro cell culture techniques with greater growing capacities. This report is focused on cell culture used in the research and production of biopharmaceuticals, which includes stem cell therapeutics. Worldwide demand for cell culture products for use in the research, development, and production of biotherapeutic drugs is forecast to expand during the forecast period. The most significant recent trend in media is a shift from serum- and animal-component-containing media to serum-free and chemically defined media. Prior to 2000, cell culture media usually contained serum, which includes undefined growth promoting factors. Serum has traditionally been used as the major supplement to cell culture media. Serum is a complex mix of albumins, growth factors, and growth inhibitors. Serum is one of the most important components of cell culture media and serves as a source for amino acids, proteins, vitamins (particularly fat-soluble vitamins such as A, D, E, and K), carbohydrates, lipids, hormones, growth factors, minerals, and trace elements. The most commonly used types are from fetal and calf bovine sources. The reagents segment of the cell culture market is driven by their increasing use in biotherapeutics research and production. Companies and research laboratories that work with cell culture want to grow cells cost efficiently and at the same levels as is possible with serum supplementation. Typically, this requires the addition of growth factors, lipids, substitutes for transferrin and albumin, compounds capable of detoxification, and specific attachment factors. Biopharmaceuticals may increase life expectancy, decrease disability, and reduce the need for health services. The approved drugs include hormones, blood factors, thrombolytics, vaccines, interferons, mAbs, and therapeutic enzymes. In the pharmaceutical industry, cell culture is a major foundation of biopharmaceutical development, bioprocessing, and manufacturing. As growing cells for biopharmaceutical production is slow, expensive, and complicated, optimizing cell culture development is of paramount concern to companies developing biopharmaceuticals. 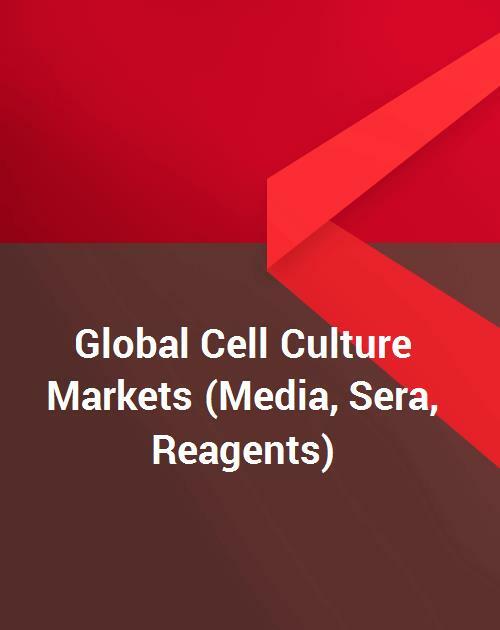 Global Cell Culture Markets notes the top-selling biopharmaceuticals in 2015, 2016, and 2017; FDA-approved biopharmaceuticals in 2015, 2016, and 2017; and biosimilars approved for human use in the US. In a market characterized by a high level of concentration, cell culture product suppliers can increase market share and sustain margins by partnering with pharmaceutical companies, or by acquiring smaller producers or companies that manufacture specialty products. Cell culture products used in diagnostics are excluded from the scope of this study. The information for this report was gathered using both primary and secondary research, including comprehensive research of secondary sources such as company literature, databases, investment reports, and medical and business journals. Telephone interviews and email correspondence were the primary methods of gaining information. For the purpose of this study, the publisher conducted interviews with key industry officials, consultants, and government personnel. These sources were the primary basis in gathering information specifically relating to revenue and market share data presented in this report. Pharmaceutical company and cell culture supply company representatives interviewed included marketing directors, division managers, and product representatives.